The ideal combination of size and performance, the ML200 Series wraps Thin Mini-ITX computing in a highly versatile, industrial enclosure. 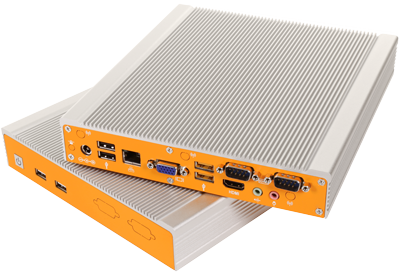 With an excellent performance-to-size ratio, the ML200 Series offers workstation class computing in a fanless, low profile, industrial grade enclosure. With its slim design and versatile mounting options, the ML200 Series can be mounted virtually anywhere, allowing for easy access or discreet installation. The ML200 Series offers a range of expansion capabilities, including optional M.2 storage and Wi-Fi connectivity, in a 1.5” tall enclosure that can be mounted on walls, monitors, or DIN rails. Logic Supply's innovative Hardshell™ Fanless Technology ensures reliability by wrapping internal components in a durable, dust free, and fanless case. The ML200 Series keeps cool by dissipating heat into the surrounding air through its unique finned aluminum extrusion. The ML200 Series protects electronics by directing electrostatic discharge through the case with the use of EMI shielding conductive foam gaskets. The ML200's nickel plated interior provides additional EMI protection. Protected by nickel plated steel and an aluminum extrusion, the ML200 Series brings aesthetic beauty to the industrial space. Defend against wear and tear, scratches and corrosion with the chassis’s durable textured paint and clear anodized finish.